"If Women Smoke Like Men, They Die Like Men"
Women smokers are more likely to die as a result of their habit today than they were in the 1960’s. That’s the finding of a recent study published in the New England Journal of Medicine, which examined data from more than two million women in the U.S.
"If women smoke like men, they die like men," said Prof Sir Richard Peto of Oxford University about the study. The fact that women are starting to smoke at a younger age and are smoking more cigarettes is being blamed for the dramatic increase in lung cancer deaths. Lung cancer is the leader cancer killer of both men and women, claiming the lives of over 72,000 women last year. And while the rate of lung cancer has dropped by 22% for men, this horrific disease has risen by a whopping 106% among women. It makes me wonder why we pay so much attention to breast cancer, but precious little to the leading cancer killer of women. Across the pond, research published in the Annals of Oncology reports that lung cancer claims the lives of almost 16,000 UK women a year compared with 12,000 who die from breast cancer. Ironically, advances in treatment and management helped decrease the number of cancer deaths overall – with the exception of lung cancer in women. 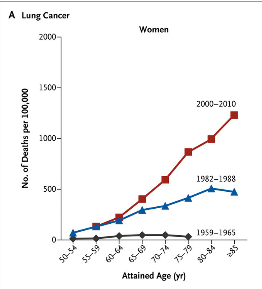 Deaths from lung cancer are expected to continue rising because women took up smoking later than men, and cancer develops later in life. 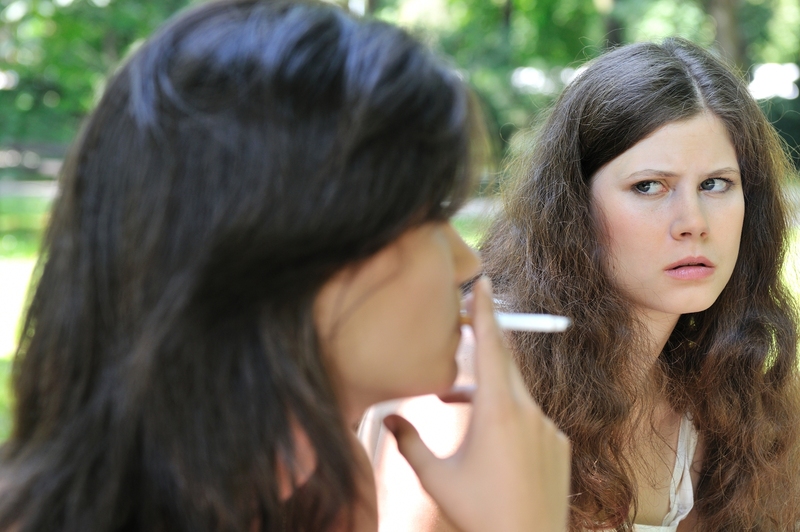 Studies show that more young British women started smoking in the late 1960’s and 70’s, possibly due to changing socio-cultural attitudes at that time. While it’s more difficult to identify the causal agents of breast cancer, there is an obvious correlation between smoking and lung cancer. To raise awareness and support smokers who want to quit, the UK is hosting a “No Smoking Day” on Wed., March 13. Women who smoke should get more than a nasty glance. They need tools such as e-cigarette starter kits! No Smoking Days and Great American Smokeouts may raise awareness about the harmful effects of smoking. But my question is: do they really help people who are addicted to smoking? Dr. Michael Thun, lead researcher of the NEJM study, said: "The steep increase in risk among female smokers has continued for decades after the serious health risks from smoking were well established, and despite the fact that women predominantly smoked cigarette brands marketed as lower in 'tar' and nicotine. The good news is that people who gave up smoking by the age of 30 almost completely avoided the risks of dying early from tobacco-related diseases. I dream of the day when e-cigarettes will completely replace all tobacco cigarettes for those who just can’t quit altogether. The best e-cigarettes are here, and they help addicted smokers. I look forward to the day when tobacco cigarettes finally take their rightful place in the scrap heap of worst products of all time. When there’s no longer innocent people who are killed by secondhand smoke. When we finally get rid of a product that kills more people than AIDS, cocaine, heroin, alcohol, vehicular accidents, homicide and suicide combined. When we finally wake up to realize that we can easily prevent 87% of all lung cancers. We simply need to rid ourselves of a horrible, outdated product whose time has come -- and gone. Lung Cancer is happen by smoking and as the above study say women more die due to their bad habit than they were in the 1960’s. If you are a smoker then you must know then you must know the Lung Cancer Symptom.